Let's take a minute to talk about makeup brushes and the difference having good ones, the right ones, make. I remember there was a time, many moons ago when I didn't know anything about brushes and thought that the brushes that came with eyeshadow or blush compacts were everything. When I look back now at what I had to work with for so many years, it pains me, and in a way impresses me. It impresses me because I used to smoke things out and seriously represent (not the way I do today natch, but represent nonetheless) using only the funkiest, cheapest, smallest brushes imaginable. Fast-forward a number of years and today all my brushes are top of the line, best quality possible, the kind of tools I have no idea what I'd do without. There are certain brushes a woman needs, and others she needs/wants. I know the difference. This doesn't stop me from buying needs/wants brushes whenever possible. I just bought some Hakuhodo brushes I'm sure I could never do without, now that I know how amazing they are. It happens. So, what are the absolutely essential brushes every woman needs, cannot do without, and must spend money on? Blush brush - this may be the most important brush to spend good money on. If your blush is not well blended it makes you look stupid. May as well have left the house bare-faced. Powder/finishing brush - most people love that really big, really fluffy brush, and it does have it's place, however, I prefer a smaller brush for finishing (fan brush is perfect, medium powder slanted brush is very good too). It allows application of powder only where needed and in more controlled amounts. Of course, when going for a very matte, very polished face, powder is key and the fluffy brush is everything. When you have normal to dry skin like mine, a light hand with powder is essential to not making a cakey, lack-luster mess. 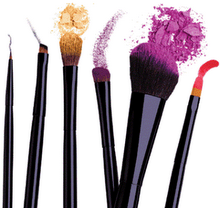 Eyeshadow brush - something that will help pack on color and not spray your face with shimmer. Shading brush/fluff brush - something that will smoke out your eye color. Very soft, very fluffy, and preferably with a tapered tip. Lip brush - for dark colors like red, raspberry, etc, there's no other way to do it properly. Eyebrow/Eyelash brush - pratical for separating eyelashes and for brushing brows. I prefer a spooli for my brows, but the little eyelash separater thingy is very handy when your eyelashes are clumped and spider-like. From that point on it's all extra, in my humble opinion. A smudge brush is cool because you can delicately smudge eyeliner, but it's not imperative. A contour brush is cool, and so is a highlighting brush. All nice, none of them absolutely important, unless of course, you're me, and then they're all super important and you dont' know what you'd do without them. A good foundation brush will change your life, but the truth is that your fingers work just fine, so you don't have to go rushing out to buy it. Kobuki brushes are way amazing, but you know, yada yada yada.